Make this cute smore for your camping or backyard scrapbook page, or even make a card to invite some friends over for a little smore party. Gather round the fire pit or the campfire! Your download includes the smore WITH the caption and the smore without the caption to make it easy to use both ways. 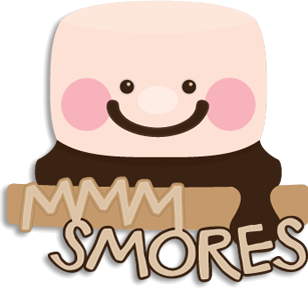 If your smore measures less than four inches wide, you will need to draw the eyes and mouth with a marker. To use the caption, your smore needs to be at least four inches wide. Happy crafting! So cute! Thanks for the freebie!! SOOOOO CUTE! I have a perfect use for this file! Whatcha gonna use it for? Adorable! Thank you for your creativity and generosity! That is a super cute file! Thanks for sharing it with us! This is adorable!!! Thank you! 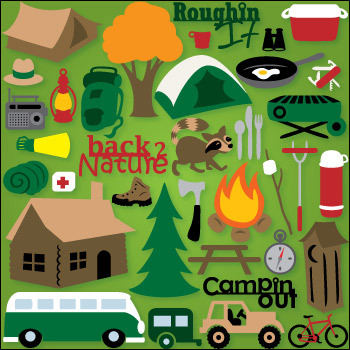 Perfect for camping layouts! Thanks for sharing! I love this file…. sooo cute.